With Easter coming up quickly on April 8th, you may be wondering if it’s safe for your little one to have Easter eggs. Eggs are a healthy, protein-rich food and they’re generally thought to be safe for older babies to eat. The USDA Food and Nutrition Service notes that you should wait to introduce egg whites or whole eggs until your baby is older than one-year, as early introductions to eggs may cause food allergies. The USDA goes on to say that egg yolk may be introduced to infants at or after 8 months of age. Because eggs are such a common food allergy, if you give your tot an Easter egg to eat, you should watch carefully for signs of allergic reactions. Allergic reactions to eggs may include hives, eczema, flushing, swelling, belly pain, diarrhea, nausea, vomiting, itching around the mouth, runny nose, wheezing, difficulty breathing, rapid heartbeat or low blood pressure. Of course, if your little one has signs of a severe allergic reaction call 911 right away. For less serious allergic reactions, call your pediatrician for advice. If your tot does have an allergic reaction, don’t give him any more eggs until after speaking with your pediatrician. No worries, your little one can still join in the Easter fun with his own chew-friendly wooden Easter egg. Keep reading for more Easter egg safety tips for babies and bigger kids. Peel Easter eggs for your child as the shell poses a choking hazard. Use safe colors to dye Easter eggs that your child will be handling. You can make natural egg dyes with plants or use a safe, non-toxic egg coloring kit. Young children who are newer to solid foods should have their egg chopped into small finger food sized pieces. All eggs should be fully cook and properly prepared with safe food handling techniques. 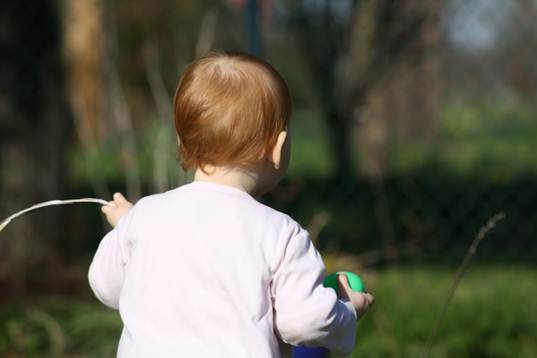 Never give your baby an egg that’s been sitting out, say during an Easter egg hunt. Eggs need to be kept properly chilled. With Easter coming up quickly on April 8th, you may be wondering if it's safe for your little one to have Easter eggs. Eggs are a healthy, protein-rich food and they're generally thought to be safe for older babies to eat. The USDA Food and Nutrition Service notes that you should wait to introduce egg whites or whole eggs until your baby is older than one-year, as early introductions to eggs may cause food allergies. The USDA goes on to say that egg yolk may be introduced to infants at or after 8 months of age. Because eggs are such a common food allergy, if you give your tot an Easter egg to eat, you should watch carefully for signs of allergic reactions. Allergic reactions to eggs may include hives, eczema, flushing, swelling, belly pain, diarrhea, nausea, vomiting, itching around the mouth, runny nose, wheezing, difficulty breathing, rapid heartbeat or low blood pressure. Of course, if your little one has signs of a severe allergic reaction call 911 right away. For less serious allergic reactions, call your pediatrician for advice. If your tot does have an allergic reaction, don't give him any more eggs until after speaking with your�pediatrician. No worries, your little one can still join in the Easter fun with his own chew-friendly wooden Easter egg. 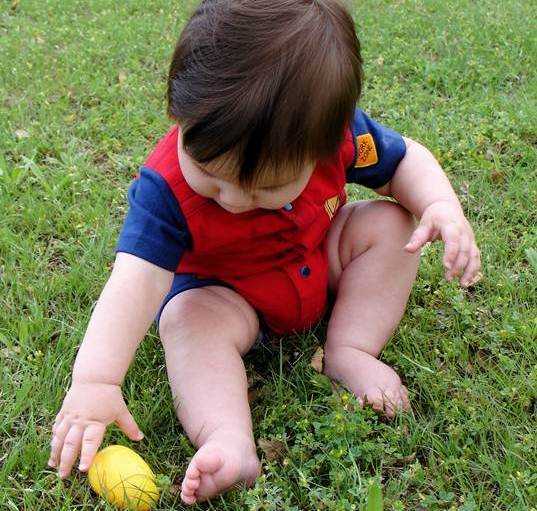 Keep reading for more Easter egg safety tips for babies and bigger kids.